Fresno, California’s HAUNT, along with the doomy BEASTMAKER, is one of Trevor William Church’s two main Metal projects – at the moment. I say, ‘at the moment,’ because with the pace of Church’s writing for both bands, I can see the prolific shredder and vocalist coming up with a new band and another album by next Wednesday. With the benefit of a home studio, Church released a total of ten (!) EP’s under the moniker BEASTMAKER in 2018, with another coming out just about a month ago. His traditional Metal project, HAUNT, just released their second full-length, “If Icarus Could Fly,” and a B-sides EP, “Mosaic Vision,” to go with 2018’s “Burst Into Flame” and a stellar debut EP from 2017, “Luminous Eyes.” A recent Facebook message reveals that he has yet another HAUNT record in the can with a possible fourth done by the end of the year. Yikes! At eight songs in barely thirty minutes, the songwriting here is taut and efficient. There’s no messing around, just straight-to-the-point melodic Heavy Metal. Album opener “Run And Hide” feels like a breakthrough with its vivid pop structure and DIO-esque we’re-in-this-together chorus. It’s a good, old-fashioned, all-inclusive rally cry, which marks a change from the subdued introspection that marks a lot of their past work. Among traditionalists, HAUNT aren’t as acrobatic or thrashy as Sweden’s ENFORCER or as speedy and deranged as Finland’s RANGER. Perhaps, the best comparison can be made to Canada’s CAULDRON, who similarly steer towards the more melodic mid-‘80s period of bands like DOKKEN and APRIL WINE. Tracks like “It’s In My Hands” and “Ghosts,” border on ballads, with Church’s sighing delivery giving shades of melancholy even in the songs’ heaviest moments. “Icarus” represents a shift in sonics somewhat from “Burst Into Flame,” and a full revolution from “Luminous Eyes,” with a larger emphasis on clarity and a sharper drum sound (played by Daniel Wilson). The kick drum, while relatively hidden on previous records, is front and center here with a wet top end that at times almost drowns out the snare. While it can be distracting, it ultimately serves to nudge HAUNT’s throwback sound into the modern age a bit. For fans of the traditional Heavy Metal sound with an emphasis on melodics and harmony, it’s hard to get better these days. While Church has a remarkable ability to emulate his heroes, he also shows a deep understanding of all the moving pieces that made those classic songs resonate, which is why HAUNT, to me, is in a different class. 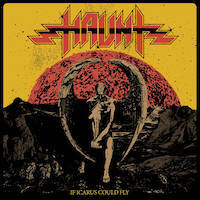 “If Icarus Could Fly” shows an incremental, but still noteworthy evolution of the band’s sound, signaling that there’s even greater things in store for those who follow along. I look forward to what next week will bring!